149 Plan of part of the additions to the Clerk-of-the-Works House on the Basement Story, Chelsea Hospital 150 Chelsea Hospital. / Section of the Basement Story of part of the additions / to the Clerk of Works' house. 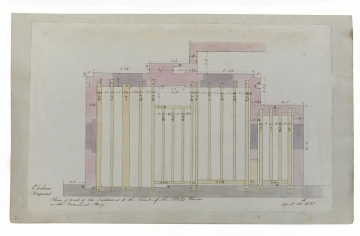 The construction of Soane's additions to the Clerk of Works' House began in April 1815. These two drawings, dated to that same month, are too neat or too finished (the shaded section) to be working drawings and are probably record copies made as part of a pupil's education. Drawing 149 shows the timber structure of the ground floor. This plan (more or less) corresponds with the top-left (south-east) corner of drawing 155. In the centre to the south wall is a space for the stone hearth slab. The wall shown in grey wash on the north side of the room was part of the original structure, retained by Soane. Drawing 150 is the corresponding section to drawing 149. It shows the south wall of the south-east corner room, with a central fire-place and windows either side of it. The beams are shown above, in the exact spacing and thickness of those on the plan. Drawing 150 also shows two beams ('bond timbers') spanning the width of each window. It seems likely that these were for temporary support, across the brickwork and unglazed windows, during construction.